Starting with Chrome 65 on Windows 10, you can use WebUSB to download with one-click. Learn more about WebUSB…. While you’re writing and testing your programs, you’ll mostly be running them in the simulator, but once you’ve finished your program you can compile it and run it on your micro:bit. A-Male to Micro USB cable to connect your computer to your micro:bit. This is the same cable that is commonly used to connect a smart phone to a computer. Connect the small end of the USB cable to the micro USB port on your micro:bit. Connect the other end of the USB cable to a USB port on your computer. Your computer should recognise your micro:bit as a new drive. On computers running Windows, MICROBIT appears as a drive under Devices and drives. On a Mac it appears as a new drive under Devices. Open the Settings for Chrome. Enable the setting Ask where to save each file before downloading. If you did Step 2 above, Chrome will ask where to save the .hex file, so save it into the MICROBIT drive. Otherwise, continue with one of the options in Step 4 below. 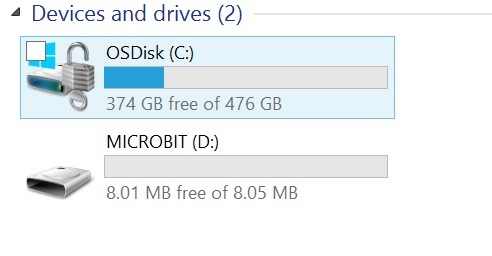 If the file was saved onto your computer, you will need to transfer it to the micro:bit. Your .hex file (created in Step 3 above) appears as a download at the bottom of the browser. 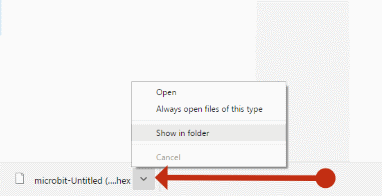 Click on the arrow next to the name of the file and then click Show in folder. In File Explorer, drag and drop the .hex file from the download folder onto the MICROBIT drive. Alternatively, right-click on the hex file, choose Send to, and then MICROBIT. The LED on the back of your micro:bit flashes during the transfer (which should only take a few seconds). Once transferred, the code will run automatically on your micro:bit. To rerun your program, press the reset button on the back of your micro:bit. The reset button automatically runs the newest file on the micro:bit. By copying the script onto the MICROBIT drive, you have programmed it into the flash memory on the micro:bit, which means even after you unplug the micro:bit, your program will still run if the micro:bit is powered by battery. Transfer not working? See some troubleshooting tips.